McKesson Medi-Pak 7”x10” Disposable Ice Pack with Ties from Incontinence Products Plus are general purpose ready to fill ice packs. They are designed for ease of use with a wide mouth for easy loading and ties to hold packs in place. Simply fill Medi-Pack Disposable Ice Packs with ice and apply to painful or swollen area as needed. The soft extra long ties assist in securing the ice pack to the body. They feature an advanced moisture wicking cover and removable inner bladder. The double locking closure on the bladder ensures a liquid tight seal. The ice pack opens easily for re-filling. They will not open unexpectedly from internal pressure. Each ice pack measures a generous 7” x 10”. 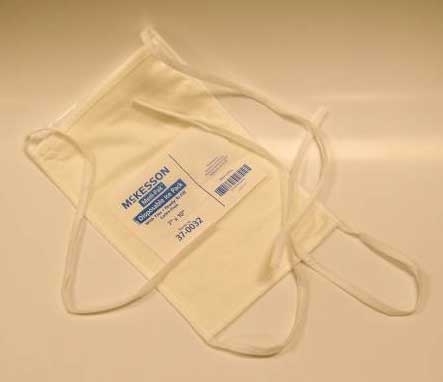 McKesson Economy Instant Cold Pack Compress Rubber Water Bottle - 2 Quart Jack Frost Reusable Hot Cold Packs 7-1/2" x 15" McKesson Deluxe Cold Pack Soft Cloth Disposable Compress 6.8" x 9"
Kwik-Kold Instant Ice Packs Regular Size 6-1/4" x 8" McKesson Reusable Hot or Cold Packs ColPac Original Reusable Cold Packs Blue Vinyl Briggs English Style Ice Cap 11"